The increasing demand for energy, raw materials and goods arising from world population growth, the emerging concept of sustainable development is concerned with meeting such challenges. The widely accepted Brundtland definition of sustainable development states that it is the ability to meet the needs of the present without compromising the ability of future generations to meet their own needs. 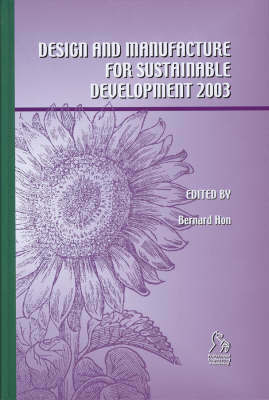 The papers in this volume are from a conference organised by the University of Liverpool in September 2003 and are dedicated to the holistic study and interchange of ideas on the theory, technology, tools, methodology for the entire product life cycle within the framework of sustainable development. "Design and Manufacture for Sustainable Development 2003" brings together industry leaders and the cutting edge of academic research in this critical area and includes: life cycle engineering from methodology to enterprise culture; teaching mechanical engineering course relating to the environment; biodegradable plastics for hygenic disposable products; assessment for product sustainability; an exploration of the role values play in designer decision making and how this effects ecodesign outcomes; laser technology applied to sustainable demolition and high energy, reusable bricks; sustainability principles for product design; and, public perceptions of sustainability, energy efficiency and recycling how these can inform the design process.